First 10 minutes of the first day of Middle School Choir! It’s the final day of preparations before the children arrive! It sort of reminds me of Christmas Eve. With up to 85 students in my classes, it is critical that I have my systems and processes in place at all times! So…let’s go on the tour of the first 10 minutes of experience in my middle school chorus class on the first day! Click this link to go on a video tour of my classroom set up for the first day! 1) I used Infinite Campus, our grade book, to print labels of the names of the children in each class. It was quick and easy! 2) I created seating charts. It is very important that they have a place to be from the first moment of the first day. 3) I placed the labels on the chairs to correspond with my seating charts so that I can call their names of the first day if I need to do so! I don’t check roll by calling names out loud. On a normal day, to check roll, I do a quick scan with my charts and make quick notes in pencil. More about how I check roll on the first day below the picture. 4) I copied a word find for them to do. This helps keep them busy while I deal with late comers, lost children, and folks whose schedules were changed at the last minute. They will be busy with the word find for about 10-15 minutes. I play “spa” music! It relaxes them AND me! I know my 7th and 8th graders well, but I am meeting the sixth graders for the first time. So, I quietly walk up to each 6th grade student in their seat, make eye contact, and I say their names. If I pronounce it wrong, they correct me, and I make quick notes on my chart. I feel like this connection is critical for us to make with new students. It’s quiet, one-on-one, eye to eye and it sets up a relationship between you and the student. When we call roll out loud on the first day, the children are put on the spot to perform. Yes…even saying “here” is a performance for a middle school student, and it can go in a variety of ways! Going around the room quietly in the way I described above eliminates the performance and gives you an opportunity to connect. It is important to establish positive rapport immediately. I often say to my students: You get one chance to make a first impression. Well….the first 10 minutes of chorus class is their first impression. Structure….warmth…..calm. The next thing I want to establish on Day 1 is FUN! So, once I’ve gotten everything organized with late-comers, etc., and I feel like things have calmed down, I launch into the first lesson of S-Cubed: Successful Sight Singing for Middle School Teachers and their Students. Here is the video link to exactly what I do after things have calmed down on the first day. I took that video on the first day of school in 2013. With shortened class periods in my building on Day 1, this is pretty much all I am able to do on that first day, but I wanted to share it with everyone. Perhaps it will give you some ideas! 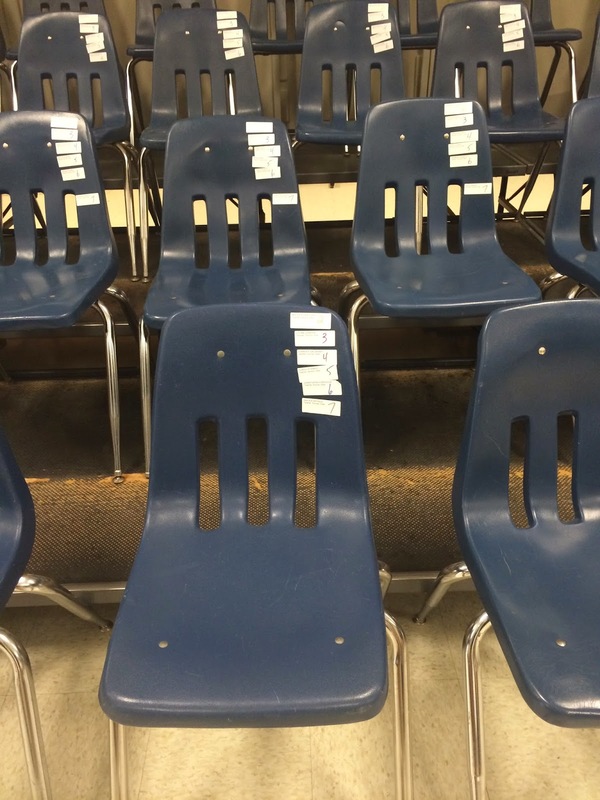 Dale, I LOVE the idea of putting the names on the chairs of the students, so you may call their names! That is such a great idea. I wish so much I had done that in my public school teaching in middle school. A name is the most personal label we own, and what a great thing it is to be able to call a student’s name (I had 1,600 elementary students each week during my first two years of teaching). Thanks so much!! 1600? Don’t know how you did it! Yes. Love having the names of children on their chairs on the first day. Middle School children aren’t used to the idea that there are thousands of “Sarah’s” in the world. It’s up to us to help them realize that fact while helping them to also feel valued. Middle School is a tricky transition for the child and for the parent. I plan to write more about that in the future. I have so much more to share!